Dan appeared on Good Morning America, Tuesday, March 4th to discuss the impact of the neighbor’s testimony in the Oscar Pistorius trial. Michele Berger testified that she heard loud screams and then one gun shot and then three quick gun shots. Her testimony is under attack as it was translated. How important is this testimony? Says Dan, “They’re crucial. If there was an argument followed by shots, that’s devastating to Pistorius’ case because his position is there was no argument. Maybe I was screaming because I was scared. 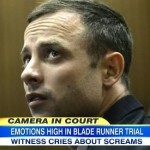 But there was no one arguing so if you’ve got these ear witnesses who live nearby saying not just that they’re hearing screaming but hearing an argument, that becomes incredibly powerful evidence against Pistorius for murder.” Watch the full clip here.